Thank you for clicking on the Starfield Secure Site Seal. 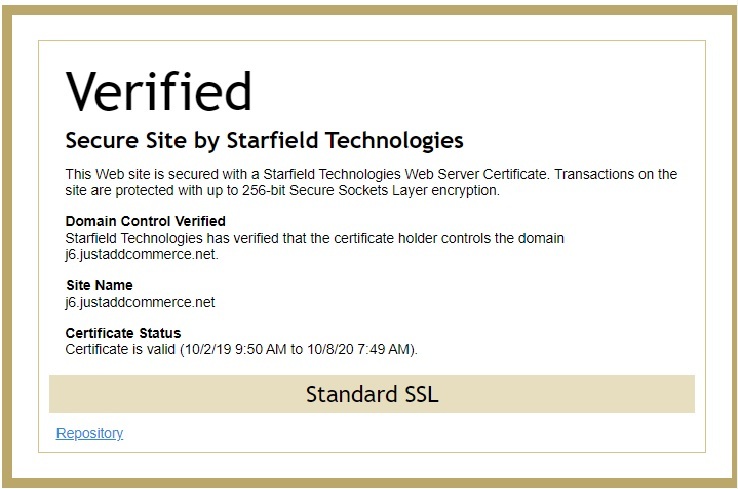 The Secure Site Seal serves to prove that the Website has passed Starfield Technologies' authentication process and that a Starfield Web Server SSL Certificate is being used to secure transactions on the site. As you proceed to check out you will automatically be transferred to a SSL (256-bit Secure Sockets Layer encryption) HTTPS server, where all your information is encrypted over the internet for the highest level of security and protection. One can think of this as a impentrable fortress around the customer's credit card information. We use Rich Media Technologies Inc. (j6.JustAddCommerce.net) as our shopping cart secured through Starfield Technologies. JustAddCommerce (the secure shopping cart used on this site) has the highest level of encryption available today through Starfield Technologies, passing an extensive validation process to guarantee security for customers, protecting their sensitive information when they order from this site. Rich Media Technologies Inc. (j6.JustAddCommerce.net) has been issued a Starfield 256-bit SSL certificate for their website, www.justaddcommerce.net, by Starfield Technologies. This Starfield SSL Certificate can be used to provide up to 256-bit Secure Sockets Layer (SSL) encryption between your web browser and their web server so that sensitive information, such as your personal contact information and credit card information, can be transmitted over the Internet safely. A Starfield SSL certificate ensures that all sensitive transactions are kept securely encrypted and safe from prying eyes, and rigorous authentication guarantees that Starfield certificates are issued only to entities whose existence and domain registrant information can be verified. Starfield SSL certificates offer industry-leading security and versatility. If you have any other questions, concerns or would like to learn more about Internet Security please visit http://www.starfieldtech.com. * Starfield Tecnologies SSL Certificates will provide the maximum encryption available up to 256-bit with AES-256 capable software, such as Mozilla Firefox, and are 100% backward compatible for web servers or web browsers that are only capable of 128-bit or 40-bit encryption.